Mold is often a problem among many homes or business facilities, as it can easily develop in humid, damp areas of a building. Many times mold is a result from water damage or leaking pipes, but it’s important to be aware that any humid area is susceptible for mold development. Any sight of mold is a warning sign, and you should call the mold damage removal professionals immediately to get it removed. 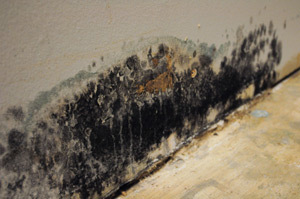 Often times, visible mold is just a small fraction of a much larger growth. Mold growing in facilities or homes may be toxic and create harmful health complications such as allergic reactions, illnesses, and breathing troubles. ServiceMaster Cleaning and Restoration Services are your experts for mold remediation. Our technicians are professionally trained and prepared with the most advanced tools and equipment to remediate any mold situation. Our professionals will find and locate the main source of the mold, employ expert mold removal techniques, and implement measures to prevent future mold growths within the area. Rely on ServiceMaster Cleaning and Restoration Services for any and all mold remediation services.